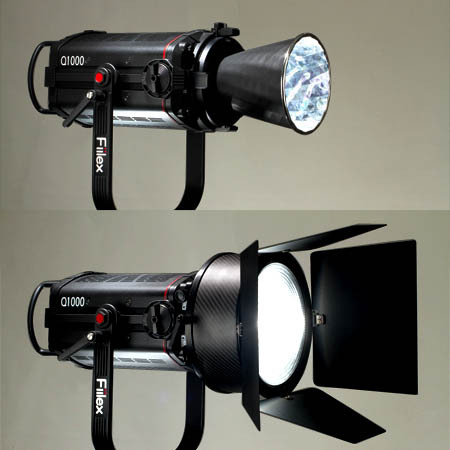 San Francisco, CA - April 7th, 2015 - Fiilex, a leader in LED lighting for the broadcast, film, and photo industries, proudly announces the release of their stunning new light, the Q1000. Designed to lead the powerful Q-series line, the Q1000 produces a brilliant 1500W equivalent output while drawing just 340W. The light uses the proprietary Dense Matrix LEDTM array to tightly pack many LEDs together in one small space, creating a flexible and modifiable single source light. The Q1000 maintains the same color spectral versatility of the award-winning Q500, boasting a tunable extended color temperature range of 2800K-6500K. The light is clean and accurate at all color temperatures, receiving outstanding TLCI (>98) and CRI (>96) ratings for its precise color rendition. It offers full dimming from 100% to 0% with no color spiking, and a hue control of ±.25 Magenta/Green for deft hue correction on set. Weighing less than 13 lbs and featuring enhanced weather-resistance (IP-24), DC power, and built-in DMX control, the compact Q1000 can be easily rigged into any studio or used for on-location shoots. The light is compatible with a new line of accessories for the Q-Series, including an 8-Inch Fresnel, PAR Reflector, Para Softbox, and Speed Ring for any standard softbox/octabox. "With the Q1000, we've accomplished our goal of creating a unique product that will truly take creativity to the next level," says Brent Siebenaler, Brand Manager of Fiilex. "The Q1000 delivers a major increase in output while maintaining the exceptional color accuracy, handy battery options, and enhanced weather-resistance that users need to shoot anywhere and to push the limits of their work." The Q1000 comes with adjustable Barndoors, a 5-Inch Fresnel Lens, a Power Adapter, and a Power Cable. The light is compatible with all Q-Series accessories and many of the magnetic P-series accessories. The Q1000 is available for order now from dealers throughout the U.S., Canada, and Europe, with delivery in Fall 2015. The U.S. retail price is $3495.00. For a complete list of dealers and accessories please go to www.fiilex.com.